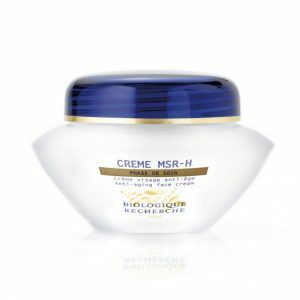 Crème MSR-H combats the signs of age through its regenerating, moisturising and anti-ageing action. Its action specifically targets the physiological effects of menopause on the skin; the cream therefore responds to the specific needs of mature Skin Instants®. Containing shea butter and beeswax to moisturise and soften, this cream will relieve epidermal tightness by intensely hydrating the skin and improving its elasticity. It also contains yam and soya to help with hormonal imbalances, and Vitamin E to fight free radicals. The regenerating and rebalancing properties of Crème MSR-H restore your skin’s brightness and freshness, leaving you looking radiant.